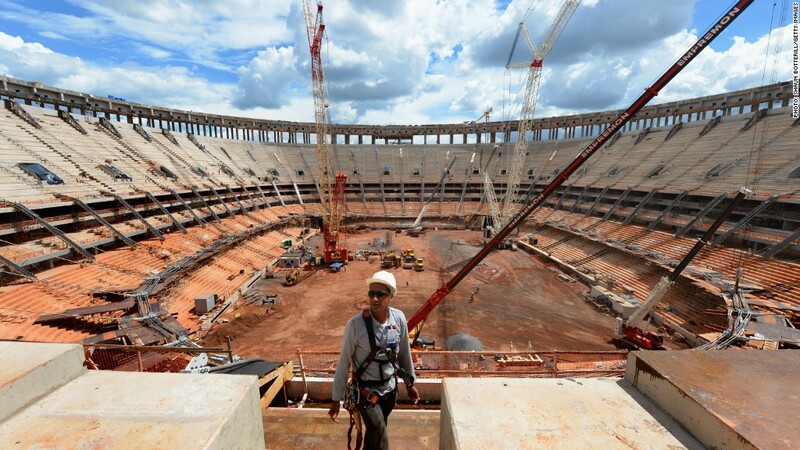 A stadium under construction as Brazil prepares to host the World Cup. Hosting the World Cup might provide a small boost to Brazil, but it won't be enough to snap the country's economy out of its current funk. Once tipped as one of the brightest emerging economies, Brazil has seen growth fall off a cliff in recent quarters as long-term problems bubbled to the surface. Its workers are unproductive, infrastructure spending lags and protectionism remains in vogue. Elevated inflation has forced the central bank to hike rates several times, and the country's credit rating was cut by Standard & Poor's to one notch above junk in March. Brazil's Bovespa stock market index has dropped more than 7% in the past year, falling faster than emerging market benchmarks. Enter the World Cup, the world's biggest sporting event complete with millions of tourists and mega corporate sponsors. To capitalize on the spotlight, Brazil is spending an estimated $11.5 billion on new stadiums, transportation and airports. Seeking to justify the extravagance, politicians promised that the event would bring huge economic benefits and improved infrastructure. Many Brazilians are skeptical about these claims. Thousands took part in street protests and riots during last year's Confederations Cup, the top soccer tournament in the Americas. Some said they were upset with lavish spending on sports events at the expense of the social safety net in a country beset with gross inequality. Brazilians are right to doubt the economic benefits of hosting the World Cup, according to a report by Moody's Investors Service. The credit rating agency argues that new infrastructure spending associated with the event is small for the $2 trillion economy, and benefits to businesses will be fleeting. "We see little impact on Brazil considering the limited duration of the World Cup and the size of the country's economy," Moody's said. The event carries potential risks, too. Local economies are likely to be disrupted, and already complicated air travel in the country could be affected as tourists travel between the 12 game sites. With just weeks to go before the tournament kicks off, the country has been beset by a series of strikes as workers demand pay raises and new benefits. "While the World Cup presents a potential reputational benefit, this could be marred if there were a reprise of the social unrest seen last June during the Confederations Cup or if needed infrastructure was not ready," Moody's said. Sponsors and advertisers such as Anheuser-Busch InBev (AHBIF) and Coca-Cola (KO) are likely to benefit most from the event, the agency said. Brazil faces a similar situation in 2016, when Rio de Janeiro hosts the Olympics. Preparations have already been plagued by delays and allegations of rampant corruption. Elected officials have again sought to bolster their arguments for holding the Games by predicting big gains for the host city and country. But most independent economists say the real cost of the Olympics is more complicated to determine -- and certainly not as rosy as politicians portray.